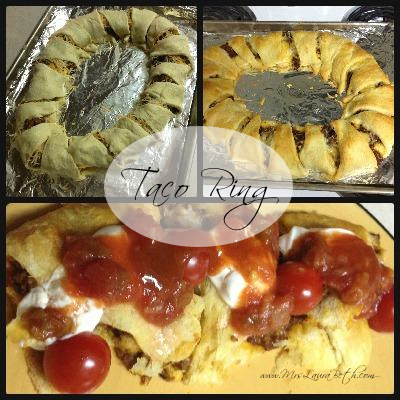 Mrs. Laura Beth: Taco Ring - Super Easy! Taco Ring - Super Easy! Need something to make for supper that is SUPER easy but still tastes good? I have the perfect Taco Tuesday recipe for you! Preheat oven to 375. Line a baking sheet with tinfoil and start overlapping the thicker part of the crescent triangles to form a circle. Spread your meat along the thicker part of the crescent rolls you just laid out, top with cheese. Now fold the smaller part of the crescent rolls over the meat and cheese. Bake in the oven for 10-15 minutes or until the crescent rolls are golden brown. I'm making this for gameday on Sunday!!!! Looks delicious! And so easy. I am gonna have to try it later this week! Thanks for sharing! I am so freaking excited about this I can't even tell you. I'm making it ASAP. This is really making me hungry! May try a vegetarian version this week! This looks delish! A friend of mine used to make this in college and I forgot how much I loved it!